The world-famous sweetness of the Japanese peach has now been captured and packed into a petite pink wrapper. Overflowing with the sweet fragrance of white peaches and soft and oh, so chewy! 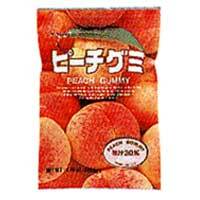 When you chew on one of these peach gummies, the juicy flavor seems to well up and the sweet taste lingers on and on.